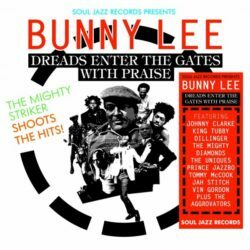 Soul Jazz Records presents this new collection featuring the heavy 70s roots reggae of Bunny Lee – a living legend, one of the last of the great Jamaican record producers who helped shape and define reggae music in the 1970s from a small island sound into an internationally successful musical genre. From teenage fan to young record plugger for Duke Reid, Sir Coxsone and other early pioneering Jamaican musical entrepreneurs, Lee has spent his whole professional life inside the Kingston music industry. In the 1970s he rose up to become one of the major record producers in Jamaica alongside Lee ‘Scratch’ Perry and the other ‘small axe’ producers who broke the dominance of the ‘big tree’ producers that had ruled Jamaican music in the 1960s.  Featuring some of the heaviest Jamaican artists, including Johnny Clarke, King Tubby, Dillinger, Prince Jazzbo, Tommy McCook, The legendary Aggrovators (featuring Sly and Robbie), The Mighty Diamonds and more, the album is a rollercoaster ride of rare, deep and classic 1970s roots, dub and DJ sounds. During this era, ‘flying cymbals’, crashing reverbs, dark echoing thunderclap gunshots and other ‘implements of sound’ filled his record productions as Bunny Lee explored the outer limits of dub with his friend King Tubby in the mix on wild versions that accompanied any 45. A Bunny Lee record provides a creative and mysterious hidden guide to reggae music itself, a double-sided three-minute intangible history lesson etched in wax. Bunny Lee was one of the first Jamaican producers to travel to England in the late 1960s, at the beginning of the nascent British reggae music industry as record companies such as Trojan, Pama and others began licensing Jamaican music in the UK to supply the expanding West Indian communities living up and down England. Lee encouraged other Jamaican producers to do the same, including Lee Perry, Harry J and Niney The Observer and also became a conduit between the British music industry and numerous younger Island-based producers – a frequent flyer reggae ambassador, a musical courier exchanging tapes for royalties. Most of the recordings featured here come from the mid 70s, a time when Bunny Lee was definitely in the zone, releasing heavyweight singles at an almost unstoppable rate. Bunny Lee’s career stretches over five decades and he has upwards of 2,000 production credits on vinyl.